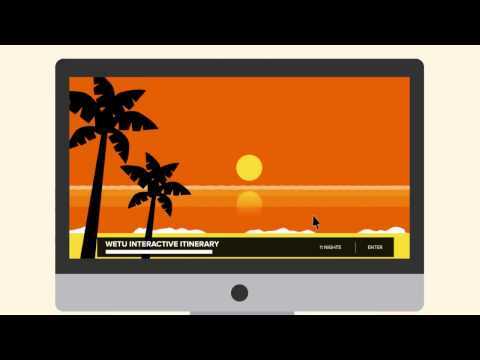 Wetu is a web-based solution that helps tour operators create digital itineraries, iBrochures, and virtual brochure racks. The solution is available for two different types of users – tour operators and tour suppliers. Wetu is used by travel agents, destination management companies, tour operators, restaurants, accommodation providers, and activity management companies for content management and distribution. Wetu offers an itinerary builder feature that helps tour operators create interactive itineraries in multiple languages and connect with potential clients from across the globe. The itineraries can be built in a mobile friendly format to help convert more enquiries into tour bookings. The solution also provides content management features that allow operators to add images and other current information to the travel content. The tool helps to create a centralized source of content that can be managed by multiple product suppliers. Wetu's customizable branding features enable tour operators to access iBrochures from multiple suppliers and rebrand them with their own logo, contact details, and other information. The software also lets users create digital catalogues that can be distributed to agents for marketing and tour booking purposes. Wetu enables travelers to access tour related details on their tablets and smartphones via native iOS and Android apps. Users can also access directions, maps, and other tour information in both online and offline mode. The solution enables operators to integrate itineraries provided by Wetu into their website or software using APIs. Wetu integrates with other travel software such as Tourplan and Travelogic. Excellent sales tool and easy itinerary building! I have successfully used Wetu to sell itineraries throughout Africa. My clients absolutely love this tool and it is incredibly easy for me to quickly create and then edit itineraries during the planning process. With one click, I can also create a PDF for my clients who like paper documents. I have created sample itineraries on my website to give clients an idea of what is possible in Africa within the typical US holidays and get great feedback on the interactive Wetu tool. Customer service has always been very responsive to me. Ease of use to build and then edit complex itineraries. Up to date images and information on all the properties helps to sell the itinerary. Interactive and interesting for clients. The map feature is so appreciated by my US clients who need to know where all these places are located! It's good value for money. Ease of use to build and then edit complex itineraries. Up to date images and information on all the properties helps to sell the itinerary. Interactive and interesting for clients. The map feature is so appreciated by my US clients who need to know where all these places are located! It's good value for money. I am hoping for WETU to expand to other areas of the world a bit faster. I know they are working on it and I look forward to using this tool to plan my other trips too. Basic framework causes loss of work done if one is not very careful. You cannot just hit a back arrow. It exits the programme! Thanks for the awesome review, John. It's great to hear after all these years you're still happily building itineraries quickly with Wetu. Just so you know, we're busy updating our Itinerary Builder - soon you'll be able to hit that back arrow with no regrets. Another reason we love getting feedback from our clients! Using Wetu has taken our itinerary presentations to prospective clients from antiquated and pedestrian to state-of-the-art and exciting. It is easy to use even for someone who has no training or experience. Strong visual appeal which is essential in the travel business. Strong visual appeal which is essential in the travel business. It would be nice to have a short(er) printable version of the itinerary (outline) available for clients to be able to print themselves. Josef, we're so pleased you are enjoying our ongoing support, thanks! It's important to us that you find the system easy to use and that Wetu has changed the way you present your exciting tour to prospective clients. Itinerary creation is just made so easy with the knowledge that all the destinations that you would like to possibly include have detailed copy which will honestly and professionally describe the whole product for you. Along with the copy comes a fantastic array of high quality photography that helps say it all.The iBrochure feature is one of my many favorites. It's like having the whole of the travel industry right at your fingertips. It makes you feel empowered. The iBrochure feature is one of my many favorites. It's like having the whole of the travel industry right at your fingertips. It makes you feel empowered. I can't think of anything that I *don't* like. I do find some portions of the features slow, but then that also could be caused by my own computer's speed. Hi Ken, thanks for your kind words. Our purpose is to provide you with even more functionality that you'll love and to continue empowering you with better tools. • Wetu allows tour operators to internally classify each supplier by rating their properties on the basis of various parameters and flagging those items that require urgent attention. • The solution offers an itinerary dashboard that lets users build virtual itineraries by adding fields such as accommodation details, route, planner, reviews, and additional itinerary information. • Wetu enables travel agents to lock a particular component of an itinerary so that users who do not have admin rights cannot edit it. • The platform offers itinerary analytics features that help tour operators analyze the total number of views and the time spent by different travelers on each itinerary. • Wetu offers template customization features that allow users to create a digital presentation for their website by using classic itinerary templates available within the solution. Below are some frequently asked questions for Wetu. Q. What type of pricing plans does Wetu offer? Q. Who are the typical users of Wetu? Q. What languages does Wetu support? Q. Does Wetu support mobile devices? Q. Does Wetu offer an API? Yes, Wetu has an API available for use. Q. What other apps does Wetu integrate with? Q. What level of support does Wetu offer? Q. Which apps is Wetu compared to most often?